Of Vanity, Narcissim and Prejudice: A Heart-to-Heart With Myself. I am disturbed. Disturbed at how quick it is for me to judge and criticize others; disturbed at how, despite my best intentions, I mostly end up thinking that I am better, that I could do ‘it’ better; and disturbed because I am not alone and what I have seems to be a universal malady. 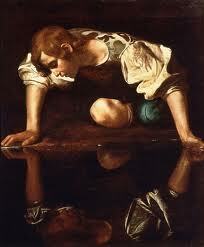 ‘I weep for Narcissus,” the lake replied. What really struck me as I read this particular portion was the lake’s reasoning for mourning and weeping for Narcissus. It mirrors my behavior as I interact with others. It would be easy to ‘hate’ Narcissus and to vainly believe that I am above his sort of blatant self-indulgence but looking closely I realize that I am probably more ‘lake’ (for lack of a better word) than I would care to admit. It is so much easier to ‘do good’ when I know that it will make me ‘look good’. Which brings me back to being disturbed and I begin to wonder… Would it be possible to listen and really ‘hear’ another person without relating it to myself? Would it be possible to look and really ‘see’ another person without shades of prejudice? Then I would not sit in judgement of another and I would be truly free. Free to love without fear. Free to enjoy the beauty and the wonderful talents in others without competition. Most of all, I would be free to be myself and all that I aspire to be. And that is just the point. While being ‘narcissistic’ is a bummer, I shouldn’t be the ‘lake’ either. I should not be so vain as to imagine that everything is about me whether it is through being overly critical of others or not realizing how much others are worth because I am too involved in myself. Did I just have an epiphany? Probably. Will my life change because of it? Maybe not as much as I would like to believe but I will make an effort. To listen more, to understand more, to judge less and hopefully to be kinder where I do not understand with the realization that this may just well be another ‘baby step’ towards the person that I’d like to be. This entry was posted in Reflections and tagged Beauty, Ego, Literature, Narcissus, Paulo Coelho, prejudice, pride, Vanity by Binah. Bookmark the permalink.